From Farringdon Station walk north along Farringdon Road for about 300 yds and cross Clerkenwell Road. Cross to the west side of Farringdon Road and continue for about 100 yds. Turn left into Ray Street and at the junction with Back Hill (left) bare right along Warner Street. Bath Court is about 100 yds on the right. Adjacent to the steps leading up to the Rosebery Avenue Viaduct is this forlorn looking entry. It doesn't own much character now but it was once a well walked river-side path leading to a money spinning idea of Walter Baynes, a barrister of the Inner Temple. In 1697 he ploughed his surplus cash into the purchase of fields lying along the west bank. With an eye on the property market he estimated that a few years on, the sale of the plot, as building land, would realise a nice little nest egg. One day, while surveying his newly acquired investment, he noticed that, although the days had been dry, the ground he was treading seemed to be waterlogged. Investigating further he came across a jet of water bubbling out from below the surface and, as he stood scratching his head, it came to him that this could be his lucky day. It was, and he made a tidy packet conning the public into the belief that regular bathing in the water was a cure for every ill under the sun. Bath Court leads northwards from Warner Street, following the same line as it did when the smelly Fleet aromatized these parts, to Coldbath Square, commemorating the site where Mr Baynes built a bath-house over his treasured spring. In the early part of the 17th century the Square was built around the still standing bath-house but in 1892 the construction of Rosebery Avenue resulted in the demolition of its western side. Bear Alley is known to have existed prior to the Great Fire of 1666 and probably took its name from the Bear Inn which stood near to here. As a tavern name 'The Bear' became popular in the early 16th century when bear bating hovered around the top of the list of popular sports. Sporting tavern keepers, in an effort to poach custom from neighbouring hostelries, were always eager to promote tournaments of one kind or another in their yards and we have no reason to suppose that mine host at the Bear on the banks of the Fleet was any different. Up until 1874 Bear Alley used to turn in a south-easterly direction to link up with Old Seacoal Lane but the laying of railway lines into the newly constructed Holborn Viaduct Station caused it to be turned into a cul-de-sac. Today it is a dreary place, accessed beneath an eight storey rustic brick building, and houses private parking spaces for Barclays Bank plc. In the same year as the Alley lost its dignity, Farringdon Street lost its market. In those days Farringdon Street was the widest street in the City and almost opposite to Bear Alley, on the west side, the Farringdon Market had flourished for forty-five years. It replaced a market of much longer standing, known as the Fleet Market, built on the banks of the stinking river in 1737, and cleared away in 1828 through an appalling reputation gained from the unlawful occupants of the dozens of alleys leading from its perimeter. Although the Farringdon Market had endured the inadequate conditions of its sloping site for so many years, market days came to an end when the stalls were transferred to Smithfield. From London Bridge Station cross to the west side of Borough High Street and continue in a southerly direction. Cross Bedale Street, bear right into Southwark Street and then turn right into Stoney Street. Take the first left into Park Street following it round to the right and then left. Bear Gardens is about 240 yds on the right, just to the west of Southwark Bridge Road. On the site of Bear Alley there stood one of Southwark's most popular entertainment attractions - that of bear baiting; the macabre spectacle that drew men and women from miles around. As gory as it might have been, the sport allured droves of spectators from all over London and from all walks of life. Bear baiting around Bankside began in the 1540's as an alternative nice little earner to line the pockets of the racketeers who ran the unvirtuous establishments which once graced these parts. It all started when a bill was passed by Parliament to abolish the 'stewhouses', or brothels as we know them, and led by Henry VIII the members actually promoted the instigation of bear baiting arenas. Henry was an enthusiastic sports spectator and with his first experience of baiting he became rivetted to the blood-thirsty contest. So enthralled was he with the sport that he ordered his henchman to bring him an assortment of the finest grizzly animals to be had. It happened that the servant returned with specimens that His Majesty would be pleased to show in any circle, and as a result the man was appointed Yeoman of His Majesty's Bears. The arena which occupied the site of the Alley was a circular construction surrounded by fencing to protect the spectators who gathered around the perimeter. Against the force of hundreds of bodies it was not unusual for this fencing to give way, leaving the spectators exposed to the vicious beasts, which all too often resulted in tragic consequences. With the entertainment about to begin, the bear was led out and tethered to a stake, already handicapped through the common practice of filing down the teeth. As the tension mounted and the crescendo of shouts from the crowd reached a peak several snarling bloodhounds or mastiffs were set loose from their kennels to snap and tear while the restricted bear could do little in defence other than rear up on its hind legs. Frequently the tether was too weak or the bear was too strong and the real fun started when the wild animal broke loose. Bear baiting steadily diminished in popularity towards the end of the 17th century and the proprietors found it increasingly more difficult to attract sufficient spectators to support the events. The Bear Gardens closed down in about 1682 but the sport continued in other parts of the City and was not declared illegal until 1835. The approximate site of the Bear Gardens arena is estimated to have been a few yards north of Park Street, where the Alley opens out into a small square. A little further to the north were the out buildings where the bears were caged, and the gnashing dogs made ready for the bloody fight. Also around the site would have been the houses of those associated with the running of the arena - the promoter and livestock handlers. On the corner of Park Street is the Shakespeare Globe Museum with its entrance in Bear Gardens. Exhibits on view are models of some of London's early theatres together with other models depicting Shakespearean history, and upstairs is a functional reproduction of a 17th century playhouse. The Georgian warehouse housing the Museum faces onto a street of attractive cobble stones, but this is the extent of the pleasing picture which is marred by disused buildings boarded up with corrugated iron sheets. From Charing Cross UG Station (Duncannon Street exit) cross Duncannon Street and walk up Adelaid Street (this is the paved way at the east end of St Martin's church). At the end cross William IV Street into Chandos Place and take the first left into Bedfordbury. The Court is then 50 yds on the right. If you had taken a stroll down Bedford Court 200 years ago you would have found it a hive of bustling activity. It was said to be 'a great thoroughfare and a place of trade'. Such was the attraction that had it continued in popularity to this day, the pavements of Oxford Street would have been deserted and the shop-keepers of that renowned shopping precinct would have gone out of business years ago. In Bedford Court you could very well have been visiting your tailor, chosen the material for an elegant ball gown, arranging to have your old three-piece suite recovered; it may have occurred to you that your wig was beginning to look rather tatty and asked the peruke maker here to fit you with a new one. After completing the mornings business you could have handed your provisions list in to the grocer for delivery next day, called in at the pastry shop for a little treat for lunch, and before returning home rest your tired feet in the coffee house next door. About 150 years earlier, Richard Brigham, the King's coachmaker would have been pleased to welcome you to his premises here and advise on the optional extras for your new poste chase. These were the typical occupants which combined to make up the salubrious address of Bedford Court. In fact to protect the meritorious situation the fifth Earl of Bedford, in 1688, added a clause to the lease agreements wherein it was stipulated that no disreputable business or trade was to be carried on in the Court. It is likely that this stipulation came in the guise of a condition of the Crown; the fourth Earl had been plagued with problems in obtaining building permission until he agreed with the King on the distinguished style of architecture. Over the years a number of changes have taken place in the Court and one of the most significant is the line of its path. The land leased for building by the fourth Earl of Bedford in 1630 was a plot stretching from Bedford Street to Bedfordbury, with Chandos Place (then Street) as its southern boundary. However, Richard Brigham, coachmaker, to whom the land was leased, thought it appropriate to preserve a section on the west side of his plot for use as a personal storage yard. This meant constructing the Court in an 'L' shape with access from Bedford Street and Chandos Place. It remained in this layout until 1878 when Bedfordbury, then in a dilapidated condition, was renovated and widened. A new access road was made between Bedfordbury and Bedford Court and a few years later the original covered way into Chandos Place (between numbers 64 and 65) was filled in. Turn left out of Victoria ML Station then left again into Buckingham Palace Road. Take the first right turning into Lower Belgrave Street. Continue for about 100 yds, cross Ebury Street and within about 35 yds turn right. When the first Earl Grosvenor was made a Viscount in 1784 he chose to be known as Viscount Belgrave after his estate in Cheshire which he had owned since 1758. But the Grosvenor story starts to unfold at the beginning of the 18th century and by 1725 the development of a large slice of the Grosvenor family estate - that part known as Mayfair - was already taking shape. Ten years later some of the wealthiest people in the land had taken up residence. However, that section of the vast estate lying to the south, then called Five Fields, was sodden marsh lane and considered totally unsatisfactory as building land. It was not until almost a century later when Robert, grandson of Thomas Grosvenor and First Marquis of Westminster, inherited the estate that proposals to develop the fields were contemplated. One of the most enthusiastic building developers around at the time was Thomas Cubitt, a carpenter turned master builder; whilst still in the early years of his career had already shown his capabilities in achievements at Barnsbury and Gordon Square. Grosvenor held the opinion that if any man could provide the solution to the drainage problem then Cubitt was the man to approach. In 1824 Lord Grosvenor invited him to survey the estate and convey his conclusions on the feasibility of transforming the gilt-edged acres into a Mayfair overflow. By consequence, Thomas Telford was at that time finalising plans for the construction of St Katharine's Dock and Cubitt had heard whispers that he was on the look out for a site to dump the excavated earth. 'And who so vast a work achieved? What name Shall fair Belgravia's sons transmit to fame? And fenced with palaces our noble Queen? That caused Belgravia from the dust to rise. Belgrave Yard was built in about 1835, a relative late comer to his lordship's estate. Although there is some doubt that Cubitt was totally responsible for the construction, it does seem that he was the main contractor. It leaves the main street by the side of the Plumbers Arms before turning in a sharp angle to run along the rear side where it leads to garaged private parking. At its entrance a sign declares that this is a 'private mews'. The Plumbers Arms was built during the 1820's to serve a demand from the growing population of in-service employees of the many aristocrats who took up residence in the locality. It is believed to have been named in honour of the multitudes of plumbers who clung to the shirt tails of Cubitt and other major contractors in the hope of gaining work. Hanging above the doorway, the sign board of the tavern depicts the arms of the Company of Plumbers' which were granted in 1588, prior to their incorporation in 1611. The Plumber Arms, now a one bar pub, formerly consisted of two bars and a jug-and-bottle where wives queued with their vessels. From Monument Station take the underpass to Gracechurch Street/King William Street and walk north along the west side of Gracechurch Street. Cross Lombard Street and continue for about 60 yds. Bell Inn Yard is on the left. Bell Inn Yard forms one of the passageways in a intricate maze of alleys in the triangle bounded by Cornhill, Lombard Street and Gracechurch Street. It leaves Gracechurch Street via a wide covered opening lined with semi-modern office buildings and leads through to St Michael's churchyard. Until the end of the last century there was an unbroken row of old houses along the south side of the Yard but they were pulled down when the City became hungry for commercial space. The Bell Inn, which stood at the end of this Yard, dated back to the early 14th century and William Dalby was one of its first tenants who leased it for three years at an annual rent of three pounds. On Monday 3rd September 1666 the flames of the Great Fire feasted on the tinder dry timbers of the Bell, consuming it in seconds - it was never rebuilt. At one time there were no fewer than a dozen inns and tavern, many of them galleried, lining Gracechurch Street; they were presumably established to attract trade from the market men and visitors to nearby Leadenhall Market. There are still many taverns remaining today in the byways of the main street but Gracechurch Street itself can now boast but one; The New Moon at number 88. Not only was there a plentiful supply of taverns, but at least two stand-alone breweries; one of them owned by William Roke. Of this brewery it is said that one Thomas Stokes was arrested in 1386 for putting the King's mark on several barrels of ale and claiming that they were for the Royal household. For this wrongful deed he would have received a prison sentence and a daily appearance in the stocks. Bell Yard runs directly along the east side of the Law Courts, from Fleet Street at the southern end to Carey Street at the northern. Only just inside the City of London, Bell Yard is a thoroughfare where the dimensions are of sufficient width to accommodate the passage of single file vehicles, although as Fleet Street offers no exit its use is for access only. The Yard dates back to the early 15th century when a tavern or inn known as 'Le Belle' stood at the southern end. It was pulled down around 1580 and some years later was replaced by another tavern also called the Bell, but that too has long since gone. As might be imagined the dominating theme of Bell Yard is law, and along the eastern side of its length, there are barristers chambers and solicitors offices. Academic and court robe makers Ede and Ravenscroft have their bookshop here and a few doors away are the book publishers, Butterworths who specialise in works of legal interest . At the northern end of the Yard are the gleaming white painted offices of the Law Society. Many of the frontages to the buildings have been renovated and modernised, some have been faced in granite. Behind high railings on the west side the Royal Courts of Justice takes up the entire length of the Yard. We may, with a high degree of surety, presume that Bell Yard has not always been the agreeable place it is today for in 1736 Alexandra Pope referred to it as 'a filthy old place'. Joe Frances, breeches maker, had his lucrative shop here in Bell Yard but, as was usually the case in those days, prosperous business men didn't invest their money wisely. He was a gambler and a heavy drinker, preferring to sit every evening in the Three Herrings tavern a few door away. His sons were both thieves, the eldest following the trade of a pickpocket and the other spent the daylight hours posing as a blind beggar, sitting in the gutter with hands out stretched. His daughter was of no better character; a notable prostitute, regularly seen loitering around the courts and alleys off Fleet Street. 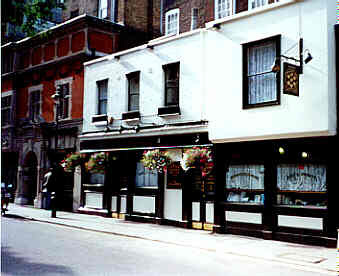 At the north end of Bell Yard in Carey Street is the Seven Stars, local to the Royal Courts of Justice and frequented by its practitioners and associates. It is thought to have been built about 1602 when it was known as the Leg and Seven Stars. To describe this treasured old tavern as basic would perhaps be quite fitting but it is not basic in the sense of unattractive. The house has a most appealing charm and character rivalled by few other London pubs. On the walls of the long and very narrow bar are caricatures of distinctive legal gentlemen, some of them, undoubtedly, clientele of latter years. At lunch time, within the confines of these walls, solicitors, barristers and even judges mingle to munch, sup and discuss the business of the day. Standing is the tradition in the Seven Stars, in fact to stand or to sit is not an option - there are only two tables and there is just not room for any more. From the glass display cabinet on the counter you can choose from a wide selection of well filled rolls and sandwiches. For something more substantial there is a range of hot dish meals including cottage pie and chilli con carne, all personally prepared by the licensee. Highly recommended is the 'proper' lamb curry served with pickle and a poppadom, but get there early, the prospect of extra mouths to feed is not catered for. When nature calls, as it invariably will, the uninitiated are in for a touch of mind-boggling surprise - there are no mods and cons adorning the loo of this place. Access is via a door, behind the bar, which leads up a winding staircase to what can only be described as a private, single position room. Fuddled with bewilderment one is driven to wonder 'have I come to the right place or have I unwarily strayed into the living quarters of the licensee?' It is all very strange, but the unpretentious convenience at the Seven Stars is quite fitting - and why is that so bizarre? Only a few yard away from the Seven Stars, in the same street, are two of London's oldest parish boundary markers. Two stones by the wall at pavement height mark the dividing line between the parishes of St Clement Danes and St Dunstan in the West. The house at number 60 Carey Street is a fine example surviving from the early 18th century, and on the corner of Serle Street there is a memorial to Thomas Moore, Lord Chancellor to Henry VIII. From Bank Station walk along the south side of Cornhill for about 150 yds and turn right into Birchin Lane. Pass Castle Court on the left. Bengall Court is then a few yds on the left. A tiny covered opening leading off Birchin Lane gives access to one of the true antiquities of old London. Burrowing into the narrow passage the Court becomes slightly wider as it enters the middle section, then, once more narrowing down, it connects with George Yard and an enchanting maze of little alleys squeezed in behind Cornhill. Bengall Court still retains the appearance and character of a 17th century alley and there is almost a chance that here you could justifiably expect to come face to face with Dr Johnson or Charles Dickens. Along the north side of the Court there are some tiny 18th century houses and the rear wall of the George and Vulture tavern which has its entrance in Castle Court. Way back in the 17th century this place was known as Sun Court and by 1720 its name had dramatically been changed to White Lion Alley, although the only White Lion tavern around here was on the north side of Cornhill, near to Gracechurch Street. Just to confuse the issue it was changed to White Lion Court around 1745 and the change to the present name did not occur until some time in the 19th century, although the reason for the change is unclear. This collection of Cornhill alleys are among the finest in the City and the least touched by modernisation. However, major building developments are currently taking place in the vicinity of Bengall Court and its neighbours, and who knows how long this treasured maze of alleys will remain. From the west entrance to the Westminster Abbey walk through Dean's Yard to the gate diagonally across, on the south side. Through the gate continue straight ahead along Tufton Street, passing Little Smith Street. On the right, cross Gt Peter Street and Bennett's Yard is then about 90 yds on the right. Only sparse records detail the history of this little cut-through which connects Tufton Street to Marsham Street. At some point during the 17th century a Mr Bennett ruled the roost here, but there was probably a built-up pathway following this line long before he appeared on the scene. Of course, Bennet is the name of a herb, but to suggest that there were once allotments on this site devoted to the growing of that strain is perhaps stretching things a trifle too far. In reality, Bennett's Yard is not a yard at all; being of equal dimensions throughout its length and having an opening at both ends it would more correctly be termed a passage. A small fenced off piece of derelict ground labelled National Car Park occupies the north side while offices take up the entire length of the south side. This is a fairly narrow 'road' although sufficiently wide to allow the passage of single file traffic. Now that all the residential properties have disappeared the main purpose of the Yard is as a cut-through between Marsham Street and Tufton Street. 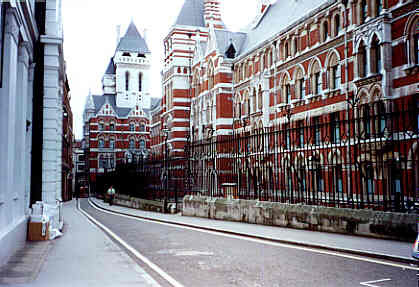 From Holborn, the Court is about 275 yds on the right side of Chancery Lane. From Fleet Street it is about 255 yds on the left. Sauntering lazily down Chancery Lane we unexpectedly come upon this narrow opening off the west side, at one time an access road leading to the town house of the Bishop of Chichester but now giving access to Star Yard and Lincoln's Inn. Where the court leaves Chancery Lane there is presently no name plate, but identification is confirmed by the presence of four telephone kiosks just inside the opening and the deep red brick building of Lincoln's Inn Works Department. The history of Bishop's Court begins way back in 1227 when Henry III secured a plot of land for the use of Ralph Neville, Bishop of Chichester and Lord Chancellor, on which to build his London residence. Until 1340 the office of Lord Chancellor was by right given to the successive Bishops of Chichester who continued to administer their duties from the London house. It is from this origin that the dusty lane, which John Stow tells us was called New Street, was renamed Chancellors Lane and thence corrupted to the present Chancery Lane. At a time of upheaval the Bishops house later passed into the hands of the Earls of Lincoln who had their London residence just to the west of here, now Lincoln's Inn. Today, Bishop's Court is plain, without any outstanding adornments, features of either architectural beauty, or relics of bygone days, but it is pleasant and forms part of a little cluster of quiet byways formed by adjacent Chichester Rents and Star Yard. It provides an escape route by which we can divert from the scurry of Chancery Lane to wander in the unhurried pace of New Square in Lincoln's Inn.